One of the most emotional picture books I’ve read for a while, The Bear and the Piano seems a simple story, but on closer inspection there is a depth and complexity to the book. It speaks of human endeavour and success. It asks what’s important in life, and addresses what it is to belong somewhere. 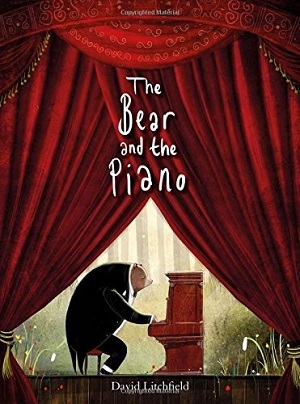 It tells of friendship and the power of music, and all in a story about a bear and a piano. One day a young bear finds a piano in the woods. He has no idea what it is, and it makes an awful noise. But after years of trying out ‘noises’ on it, the bear discovers that it can make beautiful music, and the other creatures in the wood enjoy hearing him play. Then a girl comes to the woods and tells him about Broadway and the opportunities there, and he leaves for the big city. When he finally returns, he wonders if his friends will have forgotten about him – or be cross that he left. David Litchfield’s illustrations are magical. Each picture plays with a light source: the forest floor is depicted with dappled sunlight, which throws shadows from the tall trees. The scene in which the bear leaves the wood shows the sunlight over the water illuminating the fronts of the other bears – even though their backs are to the reader as they watch the bear and the girl row away in a boat. The electric spotlights and headlamps of the cars light up the big city, and in turn the reflection of the night-time buildings light up the water. The majesty of the forest landscape and cityscape is never in doubt. Each detail is stunningly depicted – from the fur on the bear, to the expressions of the audience when he plays the piano. The bear’s face as he listens to the music he makes is beautiful – you can even see it on the book cover. It’s a sweet story – but the depth of narrative and illustration is what pulled me in. The reader discovers that the bear only manages to create beautiful music after practising for years. (The height and bulk of the bear in comparison to the piano changes dramatically over the years). There is complexity in the choices the bear has to make – leaving home and exploring the world, or staying and retaining the sense of belonging. In the end he discovers that his friends and family support him in his success and are proud of him. And this is the sweetest music of all. A lovely picture book – look at the backdrop of the forest through the curtains on the cover, and see the magic that awaits inside. One of my picture books of the year, and a debut too! To buy a copy, please click here. With thanks to Frances Lincoln Books for sending a requested review copy.